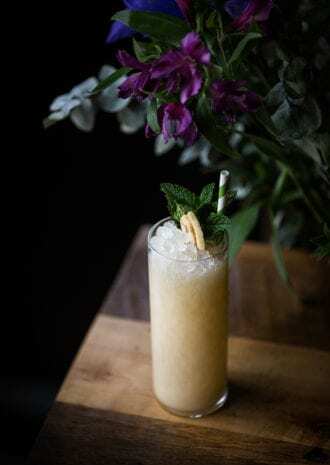 The Piña Colada cocktail gets a modern twist with barrel-aged gin and a banana coconut syrup at Watershed Distillery’s Kitchen and Bar in Columbus, Ohio. Combine all ingredients in a shaker tin and shake to chill. Strain over crushed ice. Garnish with a mint bouquet and dehydrated banana. Banana Coconut Syrup: Toast 2 cups of unsweetened coconut flakes until fragrant, then add 1½ cups of coconut milk and 1 cup of white sugar. Stir until dissolved and strain out the solids. Add 1 oz. of Giffard banana liqueur and shake to combine. 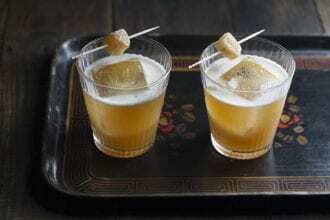 Vodka infused with dried fruits anchors this twist on a traditional Polish punch.